The Wrangler's frame construction is considered vital to its off-road capabilities by Jeep enthusiasts because it adds strength, rigidity and durability. DETROIT -- The next-generation Jeep Wrangler will continue to be a body-on-frame vehicle and won’t switch to unibody construction, Automotive News has learned. As a result, the popular off-roader will likely remain built in Toledo, Ohio, where city and union officials have been fighting for weeks to keep the Wrangler in its historical home. The developments may settle weeks of uncertainty surrounding the Wrangler, whose future was thrown into question after Sergio Marchionne, CEO of Fiat Chrysler Automobiles, implied that the Wrangler might become a unibody vehicle. At the Paris auto show this month, Marchionne suggested that the next Wrangler is likely to have an aluminum body. As a result, Marchionne said, Chrysler would be forced to move Wrangler output to another plant because the Toledo operation could not build an aluminum vehicle without a massive investment in new equipment. Marchionne suggested at the time that Chrysler had additional manufacturing capacity available at two unibody plants outside of Ohio. But now, sources inside and outside of Chrysler with direct knowledge of Chrysler’s evolving plans, say the off-roader will remain a body-on-frame SUV. That means it remains compatible with Toledo, whether or not it switches to an aluminum body. Additional sources say Chrysler is leaning towards an aluminum body. The Wrangler’s frame construction is considered vital to its off-road capabilities by Jeep enthusiasts because it adds strength, rigidity and durability. More importantly for Toledo, the construction method largely determines how -- and where -- the next generation Wrangler can be built. Unibody and body-on-frame manufacturing methods are incompatible with each other, meaning unibody vehicles can’t be built on the same line as body-on-frame vehicles and vice-versa. Marchionne -- a solicitor by training who also holds a degree in philosophy -- was very careful in how he chose his words in Paris: He did not say the Wranger would switch to a unibody. Rather, he merely implied that it would when he named plants with available capacity in the United States that were unibody plants. His comments were sufficient to ignite a firestorm in Toledo, prompting urgent discussions between him and the mayor of Toledo and representatives from Ohio Gov. John Kasich. 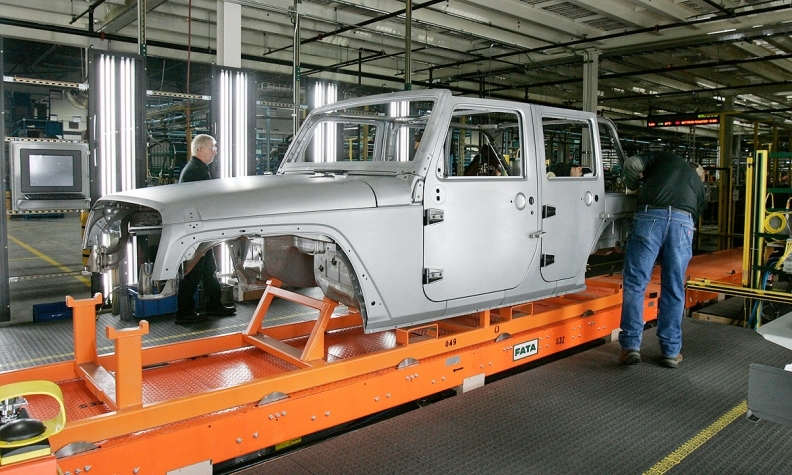 Chrysler Group has just two body-on-frame assembly plants in the United States: Toledo, where the Wrangler is made, and Warren Assembly in suburban Detroit where the Ram 1500 is built. Both plants are already running at or above their capacity to meet growing demand for those vehicles, making a costly switchover to aluminum construction for an aluminum Wrangler equally expensive at both facilities. Chrysler’s open manufacturing capacity in the United States is all in unibody plants: Sterling Heights Assembly, where the Chrysler 200 is built; Belvidere Assembly, which builds the Dodge Dart and Jeep Compass and Patriot; and the unibody half of Toledo Assembly, where the Jeep Cherokee is built. To meet tightening Corporate Average Fuel Economy requirements, Jeep needs the next Wrangler to lose weight and improve its fuel efficiency with smaller engines and a better transmission. In his remarks in Paris, Marchionne admitted that an aluminum Wrangler is under consideration by the automaker, but cost remains the overriding concern. Because of the construction methods needed to make an aluminum body, Chrysler would have to rip out its current tooling used to make a steel Wrangler and install all new equipment. That would require both a significant investment in tooling and time to shut down the highly profitable plant to make the switch. “If the solution is aluminum then I think unfortunately Toledo is the wrong set up to try and build a Wrangler because it requires a complete, a reconfiguring of the assets which would be cost prohibitive. I mean it would be just be so outrageously expensive for us to try and work out that facility,” in Toledo, Marchionne said. He later implied that the next Wrangler might be a unibody design when he noted that the automaker had available manufacturing capacity in both Belvidere, Ill., and Sterling Heights, Mich. However, he stopped short of saying it would move to a unibody design that would necessitate a move away from the body-on-frame half of the Toledo Assembly Complex. Local leaders in Toledo were caught flat-footed by Marchionne’s comments and the thought that the Wrangler might be built anywhere else. On a weekend conference call, they asked to meet with the CEO after he returned to Chrysler’s U.S. headquarters in Auburn Hills , Mich., for further explanation of what Chrysler was planning and needed. On October 9th, Toledo Mayor D. Michael Collins and representatives for Ohio Gov. John Kasich met with Marchionne in Auburn Hills. On Tuesday, 12 days after that meeting, Toledo’s city council agreed to spend $9.4 million to purchase more than 32 acres of land directly west of the Wrangler factory for its possible expansion. A spokeswoman for Chrysler declined to comment on the land purchase by Toledo. Switching the Wrangler from a steel to aluminum body would lower its weight but add complexity to its construction, as such a move did for the 2015 Ford F-150 pickup. Marchionne said in Paris that Chrysler executives were having the same discussions “inside our house now” that Ford executives had to have with the F-150 switchover. However, unlike Ford and its top-selling F-150, Chrysler has only one plant where it builds the Wrangler, and that plant is already working far above its intended capacity. A switchover to aluminum that would suspend Wrangler production for even a few weeks would eat into dealer stocks and deeply cut into Chrysler’s profits. The Wrangler is one of Chrysler’s most profitable vehicles because it sells well with few incentives. Wrangler production is on pace to reach 235,000 vehicles in 2014, which would be a third consecutive record. Despite higher production, growing demand domestically for the off-roader has forced Jeep to limit its plan to export the vehicle to more markets worldwide. Earlier this year, Jeep brand head Mike Manley said he was limiting Wrangler shipments to some overseas markets to make more of the vehicles available to U.S. dealers. Through September, dealers in the United States have sold 134,068 Wranglers, up 12 percent from a year earlier. Wrangler sales in the U.S. trail only the Grand Cherokee at 136,310 through the first nine months of the year in Jeep’s five-vehicle lineup. Sales of Jeep vehicles were up 45 percent through September to 516,387.